Description: - This species has an edible fruit similar to a very large lychee in taste and structure will grow in a tight clump new leaf maroonish pink. 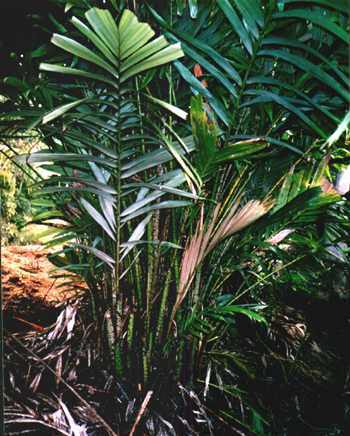 More than one palm is needed for fruit production. Needing male and female plants: will grow in subtropics very well, a frost will mark leaves but will grow out of it in spring. Growing Climate: - Likes well drained, wet spot heavy mulch to 12" thick fertilize once a year slow release. Temperatures from 2.C to 35.C.